Tip: Signup to Digital Ocean VPS account and get FREE $100 Credit. Click here to get Free $100 Credit. like this blog ashout.com) and I’m running this site on Apache web server on Ubuntu VPS (Virtual Private Server) and I wanted to run Blynk server on my VPS alongside Apache web server without affecting any of my websites. My question is, is it possible to run WordPress website along with the blynk server? So that I can install blynk server on my VPS? After doing a lot of research I Still couldn’t get an answer to my above question. So I posted this question on Blynk Community. But unfortunately, I didn’t get an answer to that question. But I got some instruction which I’m missing during my setup and finally, I was able to install Blynk server on my VPS and also got an answer to my own question. The answer is, YES. We can install the Blynk server along with Apache web server and you can run a WordPress website without any issue. But if you follow official instruction then you won’t be able to run Apace web server and Blynk server both at a same time. What you are going to get in this Guide? Blynk server needs Java to work. So we need to install Java JDK by executing below commands on Ubuntu server. Please follow any of the below method and not both method. Once you execute above 3 commands run the below command to confirm java is installed or not. Blynk needs 9443 and 8080 port needs to be open. To open those ports on ubuntu VPS run below commands. To install blynk server on my VPS server I need some place. I decided to install blynk server at /var/www/html/blynk path so I’m going to create directory at that location by executing below command. Now we need to download the latest version of blynk server. To download the latest version of blynk server first visit this page. Under “Assets” right click on the first link and copy the URL path and replace it with below URL path and execute that command. Run the below command to run blynk server in background. If you close the server terminal, blynk server will also stops. To avoid that, and to run blynk server always, we need to put below command in crontab. That’s it. Now your blynk server will be up and running. You can access blynk server server by visiting server IP address. 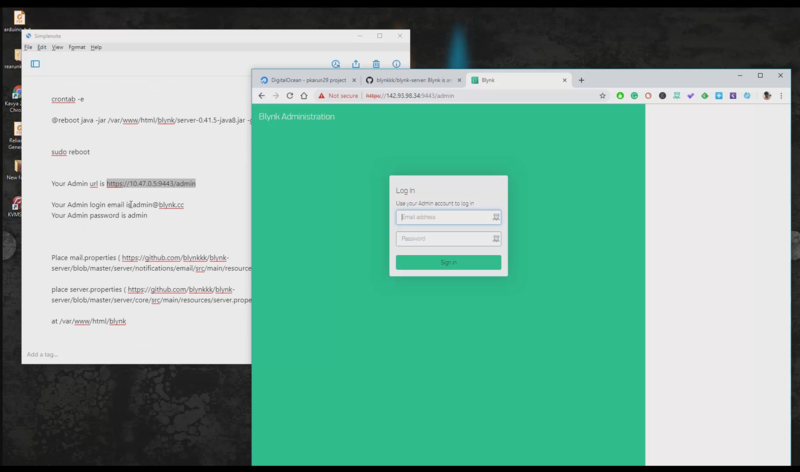 Note: Don’t get fooled by what blynk displays message saying you can access your blynk server by visiting below URL. In that URL blynk usually displays wrong IP address. By default our login details will be. Now we are able to login to our blynk admin panel successfully. We have three more extra steps needs to do. That is, setting up of mail.properties, server.properties and QR code generation. We need to setup mail.properties to get emails such as Blynk Auth tokens etc., we need to configure our gmail address here. Make sure you disable any extra security on your gmail account or else it won’t work. 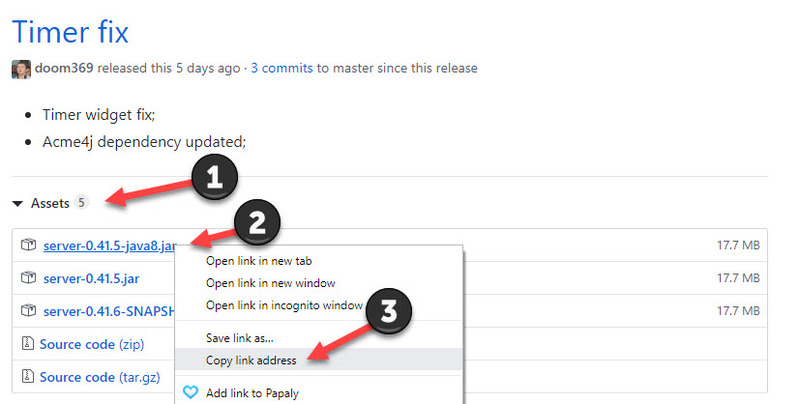 Same as mail.properties you can use server.properites files to configure blynk server configuration. Run the below command to enable QR generation on server. We are done with server setup. Now you can login on Blynk mobile app. Now use your default blynk user name and password and Server IP address and 9443 port to login to your blynk server. Note: Don’t use Blynk cloud username and password it won’t work. 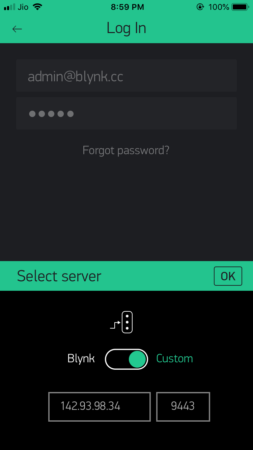 You need to create new Blynk account on app again with your server IP or you need to use default blynk login details to login. Blynk custom server IP address and Port 9443 entering with default login details to login on blynk mobile app. Finally now you are able to use your own blynk cloud server.